Press clippings, photos and more! Sundstagymnasiet, Karlstad, Sweden in October 1963. The band meet the "boys". The Phantoms supported The Beatles in their tour of Sweden in 1963 but this gig was the big one and resulted in a fantastic review in the local press. 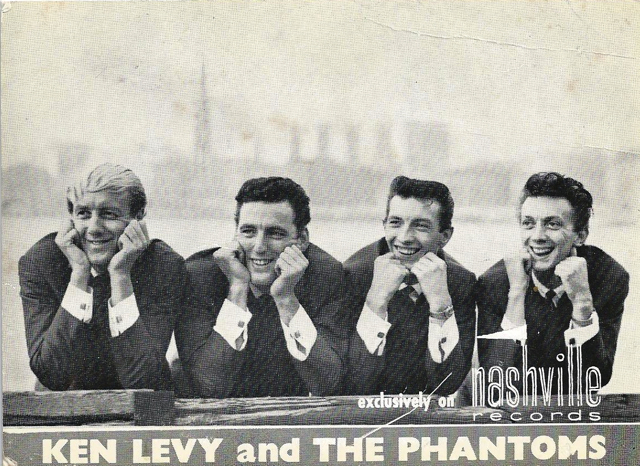 Newspaper cutting and accompanying press photographs for a review of their debut single "Phantom Guitar / Cachina" in 1961. "Good debut by The Phantoms - a British foursome made up of two guitars, bass and drums. Their beat performance of Phantom Guitar should gather in the royalties. Has quite a polish to it in the playing, though the melody itself could have been improved a bit. Better studio noise on the flip with Cachina which lifts attractively and gets a couple of title calls from the boys. A group to keep your eyes on."